There’s much at stake in the midterm elections this November: Would President Donald Trump, a Republican, keep control of the US House of Representatives and Senate. Or would both houses flip to the Democrats' side? There have been concerns about Russian meddling in US elections, leaks or alleged use of millions of voters' private data and the harvesting of Facebook profiles at a time when the country is increasingly divided over many burning issues. Here is our guide to the United States' midterm elections. What are the mid-term elections in the US? The US midterm elections are the general elections held in November every four years. It is held near the midpoint of a president's four-year term of office. How many positions are being contested? There are contests for the US House of Representatives, the US Senate, the governors of certain states, municipal mayors and some state legislatures. Federal offices up for election during the midterms are: all 435 seats in the House of Representatives, and 35 of the 100 seats in the United States Senate. In addition, 34 of the 50 US states elect their governors to four-year terms during midterms, while Vermont and New Hampshire elect governors to two-year terms in both midterm and presidential elections. Therefore, 36 governors will be elected this November. Many states also elect officers to their state legislatures in midterm years. There are about 6,000 state legislature positions up for grabs. At the municipal level, there are also elections held, with many mayors, other local public offices, and a wide variety of citizen initiatives being subject to the ballot. Who will administer the elections? All these races, regardless if it is for federal, state, or local office, are being administered by the individual state and local governments instead of at the national – or federal – level. How many voters are there in the US? In the 2012 elections, there were about 235 million people of voting age in the US, according to a study by the University of California. At that time, voting age population (VAP) turnout was 54.9 per cent. In the 2016 elections, the voting-age population was estimated at 250 million, with voter turnout of 55.5 per cent. In general, midterm elections tend to have a lower voter turnout than presidential elections.Traditionally, more Republicans turn out to vote in mid-term elections than Democrats. Opposition to Donald Trump could change that – or not. In the past 60 years, presidential elections have had turnouts of about 50–60 per cent, but only about 40 per cent of those eligible to vote actually go to the polls in the midterms. Why are pundits predicting a higher-than-typical voter turnout? Analysts predict a "higher-than-typical" voter turnout. One indication: More than 800,000 registered to vote on national voter registration day in September — a more than four-fold spike compared to 154,500 in 2014. Several states signaled they were seeing record numbers of voters registering to cast their ballots in November. In October, 19 million residents had registered to vote in California, a jump of about 1.5 million compared with the 2014 midterms. A similar trend was observed in Texas, where state officials cited an 11 per cent rise in registered voters from the previous midterms. How many absentee or early voters are there in the midterm US elections? There are 28 million ballots already cast nationwide as of November 2, with four days of the campaign left, The New York Times reported. In 18 states and Washington DC, advance vote counts have already surpassed those of the last midterm election. In 2016, more than 47 million votes were cast early, compared to 27 in 2014. This 2018, the advance vote count – which includes both absentee ballots and in-person early voting – has already exceeded the countr from 2014. There are 37 states in the US that allow for early voting. Most of these states also allow for absentee voting. What does US voting history reveal about mid-term elections? Historically speaking, midterm elections usually see the president's party lose seats in Congress. Moreover, the elections also see the president's intra-party opponents gain power. One reason Democrats are optimistic: more than 40 Republicans are not running again, including House Speaker Paul Ryan. But in the last 25 years, flipping the House has become rare: it has only happened three times. In 1994, when Bill Clinton was president, Democrats lost the House. In 2006, it flipped back to the Democrats’ side under then-president George Bush. In 2010, the Republicans have taken over the House of Representatives and they have kept it till today. What those three flips have in common: each favoured the party not in the White House. What are the odds for the two parties in the House of Representatives? The race could shift either way. On October 30, however, one week from Election Day on November 6, the pollster The Cook Political Report has shifted a half-dozen race ratings — four towards Democrats and two towards the Republicans. The report said that overall, the House of Representatives outlook is fairly stable: Democrats are the clear favourites for the majority and appear poised to gain between 25 and 40 seats. What are the odds for both parties in the Senate? The basic math for the US Senate race favours Republicans, who currently have a razor-thin edge in the Senate. About a third of the 100-member Senate (two for each state) is up for reelections. This year, there are 35 Senate seats in contest. Republicans have control over the Senate by a paper-thin margin. This November, political pundits say Republicans are likely to keep their control over the Senate. Each senator serves a six-year term and elections are staggered. They happen every two years. Of the 35 Senate seats being contested, 26 are controlled by Democrats or left-leaning independents while nine are held by Republicans. One indication Republicans are mathematically on the offence in the Senate race: 10 out of 26 Senate seats held by Democrats are running in states where Trump won in 2016, and remains popular. What about governors and state legislatures? The results could be historic for governors and state legislatures. There are 36 seats for governors being contested, and more than 6,000 members of State Legislatures will be elected. A record number of women are running, most of them Democrats. What is the “Trump factor” in this midterm elections? President Trump is a key factor in the way many Americans vote for their congressional representatives. A Pew Research Survey shows that overall, six out of 10 registered voters say that Donald Trump will factor into their vote for Congress this fall. More than a third of voters (37%) say they consider their congressional ballot as a vote against Trump, while about a quarter (23%) say they consider it a vote for Trump. 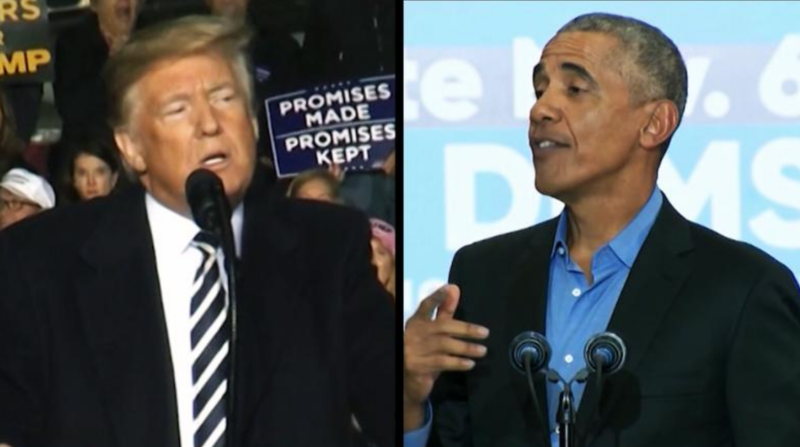 These views, Pew Research said, are split by party: 66% of Democratic and Democratic-leaning voters view their vote as a vote against Trump, while 48% of Republican voters say their vote is a vote for the president. What do voters care about in this midterm elections? Voters tend to look at the Congress as an “overseer” – or a check – on the president in power. A Pew Research Centre poll published on November 1 shows that voters are concerned that lawmakers will not strike the right balance in overseeing the Trump administration – no matter which party prevails. A majority of voters (64 per cent) say if Republicans keep control of Congress, they are very or somewhat concerned that the party will not focus enough on oversight of the administration. A smaller majority (55 per cent) are concerned that if the Democrats take control of Congress, they will focus too much on investigating the Trump administration. Coupled with the burning debate over birthright citizenship, these issues remain deeply divisive in America, with strong along partisan lines, according to political pundits. Why is it seen as a referendum on Trump? Trump is a Republican. Right now, Republicans dominate Congress, both the US House of Representative and the Senate. In this election, the control is up for grabs. If nothing changes, it would mean Americans like what they have right now and want more of it. What if Democrats take control of either house? There could be some major changes. Any Republican legislation would be stalled, or dead. There could be more investigations into allegations of corruption, Russia and Trump’s businesses. What are the major battleground states in the US Senate? So much of the Senate battlefield is playing out in at least 7 states, according to US political analysts. ■ Florida: This is a real battleground state. There are two titans on the ballot: Democratic Senator Bill Nelson is seeking re-election and is facing off against Republican incumbent governor Rick Scott, who's at the end of his eight-year term as governor. Scott has led hurricane relief efforts, directing state troopers from his own home. Despite the rave reviews that Scott has gotten for his handling of hurricane Michael and its aftermath, one poll still shows Democrat Bill Nelson leading. ■ Arizona. This is a battleground of two female candidates. It is home to one of the three contests this cycle where Democrats are on offence trying to steal in a Republican effort to win the majority. The two candidates are: Kyrsten Sinema, a Democratic House member, and Martha McSally, Republican House member. Whoever wins is going to be Arizona’s first female US Senator. McSally had a very tough primary this season and had to the run far to the Right, embracing Trump in a state that has been more and more a battleground in American politics. Sinema has been facing a heap of stories looking into the dates back to when she was in anti-war progressive. One recent poll shows Sinema up, another shows McSally taking the lead, which makes the race remain a toss-up all the way through to November 6 balloting. ■ Tennessee: Another state rated toss-up this November. It is one of the three Republican seats that the Democrats are targeting to try to win the majority in the US Senate. It is a tough contest. After the incumbent, Bob Corker, retired, Democrats scored the biggest and best recruiting effort they had: the Former democratic governor, Phil Bredesen, who is still quite popular in Tennessee, despite the voters' tilt to the Republican side in the state. Bredesen is running against House Republican Marsha Blackburn. She has had a huge support from Trump who has been to the state multiple times to campaign for her. He won Tennessee big in 2016. And he is looking to be responsible for keeping it in the Republican column in 2018. Just to note how tricky it is to run in a Republican country like Tennessee, Bredesen said: “If President Donald Trump proposes something good for Tennessee I will be with him.” Tennessee may be the biggest surprise on the US midterm map this year. ■ Missouri: It is home to one of those contests where Democrats are up for re-election in a state where Trump won by double-digits in 2016. Senator Clair McCaskil (D), is seeking her third term to the US Senate. Her opponent, Attorney General Josh Hawley (R), is painting her as out of touch with Missouri values, portraying the state as the heartland of the middle class of life, and Democrats as purveyors iof radical left-Wing agenda of the Washington DC liberals. The polls in this race had been razor-thin. It’s a dead-heat race. It has been all year long, and projected to remain so until balloting day. If Democrats lose this seat, it’s almost impossible for them to win a Senate majority. ■ Indiana: It’s one of those states where President Trump won by double digits in 2016. Democrat Joe Donnelly is up for re-election, seeking his second term in the US Senate and running up against Republican businessman outsider Mike Braun. Donnelly is in that position of Democrats in Trump country that have to dance a little bit for some Trump voters they need to win. Donnelly split with his own party to support Trump’s funding for border wall. If Democrats lose Indiana, It is almost impossible for them to win the majority in the US Senate. ■ Nevada: It is one of three states where Democrats are truly on office trying to win a state currently held by a Republican. Dean Heller (R), the incumbent Republican Senator, is the only Republican up for election in a state Hillary Clinton in 2016. Heller he is definitely therefor the most endangered incumbent Republican Senator if the 2018 cycle. Jacky Rosen, the Democratic Congresswoman, is putting healthcare front and in centre in this race. Heller voted for Obamacare, a move that caused him problems with Trump, as the president wanted him on board with the repeal. Trump has been out in Nevada campaigning for Heller. It’s been a really tight race according to polls. It’s a key presidential battleground as well. This will remain tight all the way through to Election Day. ■ North Dakota: The most endangered incumbent Senator anywhere in America, Heidi Heitkamp, is seeking a second term to the US Senate and is running an uphill climb against Republican Congressman Kevin Cramer, who is trying to tie her to the National Democratic Party, highlighting her support for Hillary Clinton. She’s had a rough final month in the campaign, set against a tough political terrain. She voted against Brett Kavanaugh in the Supreme Court, even though a majority of North Dakotans wanted to see him there. Her campaign put out a newspaper ad full of women’s names who they claimed were victims of sexual abuse or assault without their permission to do so. Heitkamp spent the closing days of the campaign apologising for that snafu. This race has always been a bit of a long shot for Democrats. Where do young voters stand in this midterm vote? Voter registration among young people is up. The Institute of Politics (IOP) at Harvard Kennedy School released results this week of their biannual survey of 18- to 29-year olds showing that young Americans are significantly more likely to vote this year, compared to 2010 and 2014. Overall, 40 percent report that they will "definitely vote" in the midterms, with 54 percent of Democrats, 43 percent of Republicans and 24 percent of Independents considered likely voters. The Harvard poll — the 36th release in a series dating back to 2000 — also shows strong support among young Americans under 30 for a federal jobs guarantee, eliminating tuition and fees at public colleges and universities for students from families that make up to $125,000, and for Single-Payer Health Care. In 2014, less than 20 percent of young people voted — the lowest rate ever — compared with roughly 40 percent of the general population, according to US census data. That trend line is unlikely to change on November 6. However, there are some positive signs for Democrats, who tend to attract young voters more than do Republicans. Where do women candidates and voters stand this time? 2018 is a record-breaking year thanks to a surge in women standing for the Democrats. There's a record number of women are standing in the midterms. It's the first time women fielded more candidates for the House than Republicans since 2008. About 1,500 people sought to be Democratic nominees for the House — 500 more than in the last mid-terms. Of those that won the party's nomination, a record 198 were women. It's been predicted that 2018 could become another "Year of the Woman" — a throwback to the 1992 polls in which the number of women in Congress doubled — due to the big jump in the number of women candidates. Today, women make up only 20 per cent of Congress. Who's winning: What do surveys show? According to a Pew Research Center survey, 60 per cent of Americans said their vote would be an expression of opposition to or support of the president. Far more respondents, by a 14-point margin, said they viewed their midterm vote as being “against” Trump. What would happen to Trump if Democrats win control of one or both houses? Trump's sweeping overhaul of the US tax system has his biggest legislative victory — but it was only because Republicans have majorities in both houses of Congress. Democrats' control of one or both of those Houses will allow them to limit how much Trump can achieve in the final two years of his term. Democrats could take control of important Congressional committees. This would allow them to launch oversight investigations into several issues, including the president's business dealings and even the allegations of sexual assault made against him. Moreover, if Democrats would win the House, calls for Trump's impeachment are likely to get louder. However, such a move could ultimately be fruitless unless Republican senators turn on the president. How many votes does the Senate need to impeach Trump? A two-thirds majority is needed in the Senate to remove Trump from office. Only two presidents have ever been impeached — Andrew Johnson and Bill Clinton — and both were acquitted after a trial in the Senate. Richard Nixon resigned before he could be impeached after the Watergate scandal in the early 1970s.